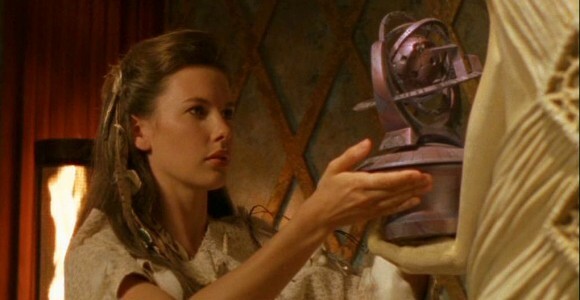 SG-1 is accused of stealing an important weather-controlling device, sending a primitive planet into chaos. The team discovers that Earth's second Stargate is being misused. 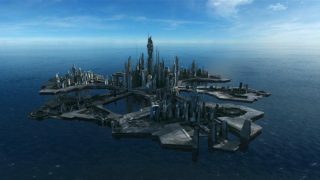 SG-1 arrives on the planet Madrona, where a less advanced culture possesses an advanced piece of technology left to protect their world from its tendency toward violent, inhabitable weather. The team reports to the S.G.C. about the device, and plans to return and study it. But upon their arrival back on Madrona, SG-1 learns that the device — called the “Touchstone” by the natives — has been stolen. Men dressed in S.G.C. uniforms came and went through the Stargate and took the device, leaving the peaceful planet at the mercy of terrible weather. The team is stunned, and reports back to General Hammond about the incident. O’Neill considers the possibility that the general might know something about what is going on — but he does not. Carter checks the base computer mainframe, and determines that someone on Earth is using the second Stargate — discovered last year in Antarctica (“Solitudes”) — to steal technology from other worlds, timing the journeys at the precise moment that the S.G.C. gate is being used, so as to mask their trails. Hammond tries to contact the president, but cannot get ahold of him. He suspects that someone may be orchestrating the president’s schedule to keep him away from Hammond. Meanwhile, Daniel has been paying attention to the weather reports, and found severe and unusual weather phenomenon in Arizona. Someone may indeed be experimenting with the Touchstone on Earth. Carter tracks the gate to somewhere in Nevada, and Hammond reveals that old SG-1 opponent Colonel Maybourne recently got himself reassigned to Area 51, the Groom Lake Facility at Nellis in Arizona, where technology discovered by the SG teams is studied. SG-1 follows up with a trip to Nellis, where they confront Maybourne. He appears to be oblivious to what they are talking about, and knows nothing of the Touchstone. He takes them to see the second Stargate, sealed up in a crate and kept under 24-hour-a-day guard. The team discovers that this gate is a plastic replica. On Madrona, blizzards have begun to threaten the local village. To try and track the second gate, O’Neill and Jackson return to Madrona and send a M.A.L.P. probe back to Earth — overpowering the Stargate to cause the wormhole to jump to the second gate, instead ofconnecting back to the S.G.C. The people of Madrona are worried; they believe SG-1 is behind the theft, and doubt that the team will restore the Touchstone to them. The plan works, though, and the M.A.L.P. arrives through the stolen Stargate on Earth. At the S.G.C., Carter uses the Global Positioning System to track the gate, while Hammond watches the video feedback. The probe is located in a darkened warehouse of some sort. A handgun appears, and a shot is fired — the transmission is lost. Carter managed to determine that the Stargate is somewhere in southern Utah, but did not have time to determine a more exact location. Hammond calls in a favor: he visits with an old acquaintance named Whitlow, who knows nothing of the missing Stargate. But, he does know that a C5 airplane was ordered for a secret transport to an airfield in southern Utah, and it’s certainly large enough to carry a Stargate. It is SG-1’s next destination. But Hammond orders them not to open fire unless they have to, since they’ll be going up against fellow Americans who may just be following orders. At the landing strip, SG-1 finds a hanger bay with the stolen Stargate inside. They also find four men, presumably rogue operatives from the N.I.D. organization, and catch them off guard. The Touchstone is recovered, but the men dial the Stargate and leap through to escape to an unknown destination. The gate deactives before Daniel can race to the D.H.D. and see the address symbols. SG-1 returns the Touchstone to Madrona, where the device restores their planet’s climate. The Madronans are thankful. The Touchstone may have been configured specifically for Madrona’s atmospheric conditions (making it impossible to use correctly on Earth). Why does using the second gate in another part of the country cause an energy surge to the S.G.C.? This is not sufficiently explained, though it may not be unreasonable to hypothesize that using two Stargates concurrently on the same planet causes some sort of interference with one another. Current Area 51 research projects include a possible cure for Alzheimer’s discovered by SG-5; Jackson’s notes on Heliopolis — “meaning of life stuff” (“The Torment of Tantalus”); and two Goa’uld death gliders stolen from Apophis when SG-1 destroyed his ships in Earth’s orbit (“The Serpent’s Lair”). There are no alien lifeforms at Area 51, according to the Major who gave SG-1 a tour of the facility. Teal’c threatens Maybourne, telling him that in his culture he would be within his rights to dismember the colonel. Maybourne recently intended to study Teal’c’s insect-caused transformation and allow him to die (“Bane”). A sly smile comes across Teal’c’s face as Maybourne tries to walk past him. Maybourne seems to know more than he sometimes lets on. He hints that the second gate was authorized by someone to be moved covertly, and that it is even being used in a civilian operation. In his conversation with General Hammond, Whitlow also presumes it to be a civilian operation — otherwise, he believes, he’d know about it. O’Neill crosses the line and breaks Hammond’s orders when he fires at the floor of the hanger, to keep the rogues from grabbing the Touchstone. One is even hit in the shoulder and injured. Hammond ordered the team not to fire at the men. Daniel barely missed seeing the address dialed on the D.H.D. when the men made their escape from the hanger. It’s unlikely that the S.G.C. could have tracked down the men even if he had seen the symbols, since he would not have known the order in which they were dialed. This leaves 720 possible addresses, assuming he could identify the seventh symbol for certain (the point of origin for Earth on that D.H.D.). But, at least it would have been a starting place; these addresses could be cross-referenced with the S.G.C. computer to see if any of them were listed as valid Stargate addresses on the Abydos cartouche. It is more likely that Jackson could have found the planet listed than that the rogue team found a valid Stargate address from another source. At the inception of the Stargate program a year and a half ago there was a philosophical skirmish over the program’s mandate. Some believed that any and all discoveries should be brought back to Earth at any cost, regardless of issues like interplanetary diplomacy. That position failed, and Hammond never fully knew who was behind the movement. There are 39 glyphs on the Stargate. Use of the second Stargate on Earth causes the first (at the S.G.C.) to vibrate, and the chevrons to flash. The Stargate appears to have destroyed the top of the crate in which it was stored when activated by the N.I.D. men. This confirms the established principle that the initial “whoosh” of the wormhole’s event horizon vaporizes anything in its path. George Hammond – General Hammond has been in the military for about 30 years. He has valuable contacts, of course, and a few favors to call in from time to time. Harold Maybourne – Maybourne has managed to have himself reassigned to the Area 51 facility at Nellis, where valuable information and technology retrieved by Stargate teams is studied. He may be involved with a conspiracy to steal technology from other worlds using the second Stargate, though he seemed genuinely ignorant of the fact that it had been removed from Nellis and replaced with a plastic replica. Who gave the Touchstone to Madrona in the first place? Was someone orchestrating the president’s schedule to keep him away from General Hammond? How far up does this conspiracy go? How did the rogue operatives make a replica of the Stargate and replace it without anyone knowing? They must have had operatives at Area 51 working with them. Who is Whitlow? What is his position in the government? What was Hammond’s relationship to Whitlow? Why did Whitlow owe him a favor? Who were the men in the hanger? Where did they gate to? How long have they been using the second Stargate? Are the rogue operatives stranded on another planet, or do they know other addresses to gate to? Will the N.I.D. men, apparently trapped off-world, continue to seek out and steal alien technologies? What benefit would this have for Earth, if there is no way to get back? How much does Maybourne know about the rogue team? How involved was he in the theft and abuse of the second Stargate? VOTE! How would you rate SG-1's "Touchstone?"